Tea tree oil is known all over the world for its numerous health benefits, including its acne-fighting ability. This volatile essential oil is extracted from the Australian native plant melaleuca alternifolia, most commonly found in southeast Queensland and the northeast coast of New South Wales. Usually a pale yellow color, this natural oil has potent antimicrobial properties and has been found to be highly effective against numerous strains of bacteria, fungi and viruses. Furthermore, it has strong anti-inflammatory properties that make it an excellent remedy for treating skin conditions like acne, back acne, dandruff, skin abscesses and acne inversa, to name a few. 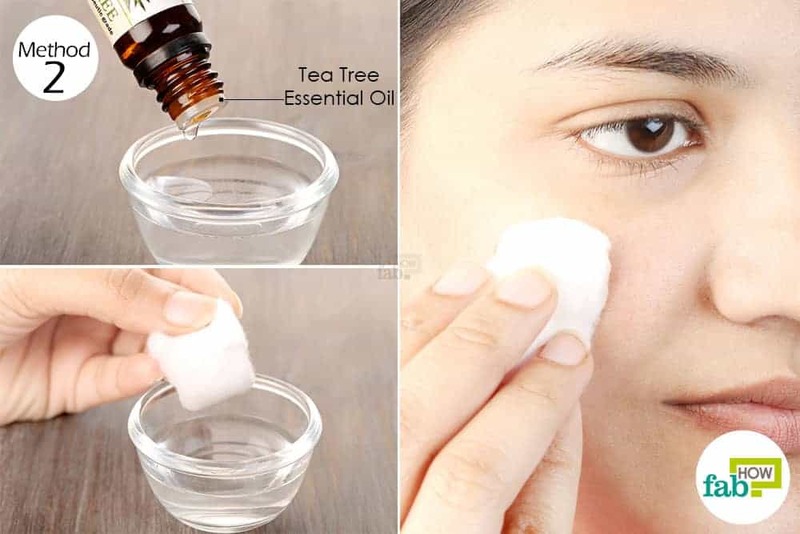 If you’ve always wanted to use tea tree oil for acne, but you weren’t sure about the correct way to proceed, then you’ve come to the right place. 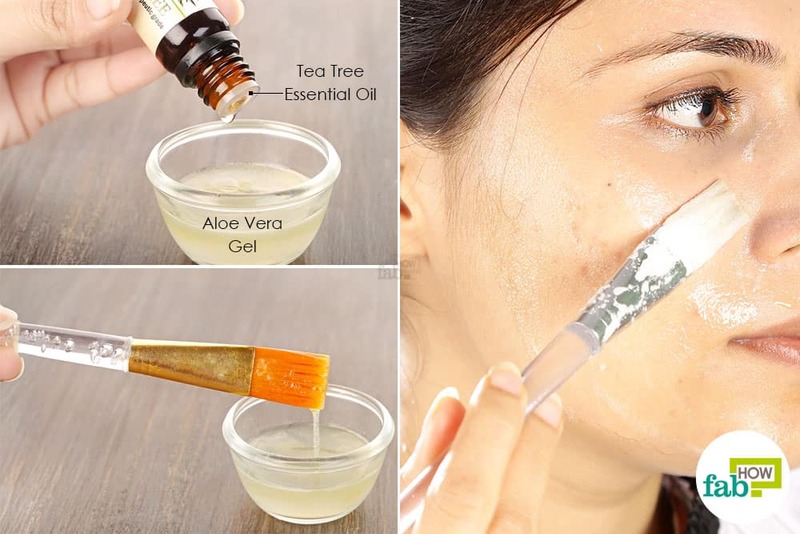 Here we show you how to use tea tree oil for acne, by elaborating upon the seven most popular remedies. Caution: Tea tree oil is a very strong ingredient. Always do a patch test before proceeding with full-scale application. 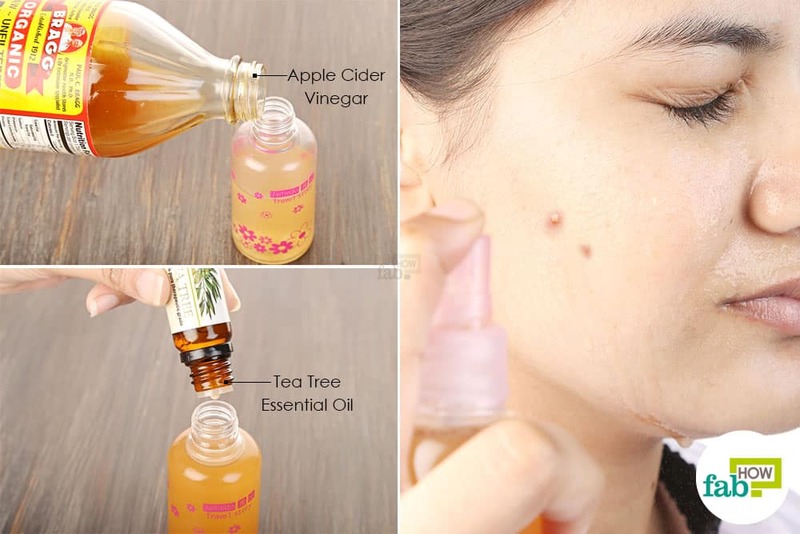 The simplest and most effective way to use tea tree oil for acne is to apply a few drops of this antimicrobial and anti-inflammatory oil directly on the affected areas. 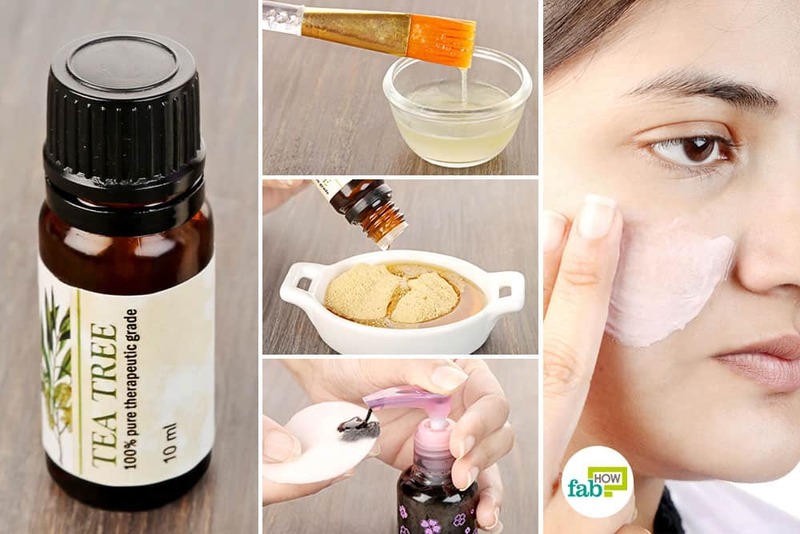 The oil will work to reduce the redness, swelling and inflammation, while also eliminating the acne-causing bacteria and drying up the pimples. Caution: As mentioned above, tea tree essential oil is a strong, volatile oil. Therefore, we recommend that you use undiluted, pure tea tree oil only in cases of severe acne breakouts. If you have dry skin, do a patch test by applying a few drops on a small area and observe how your skin reacts to it over a period of 24 hours. 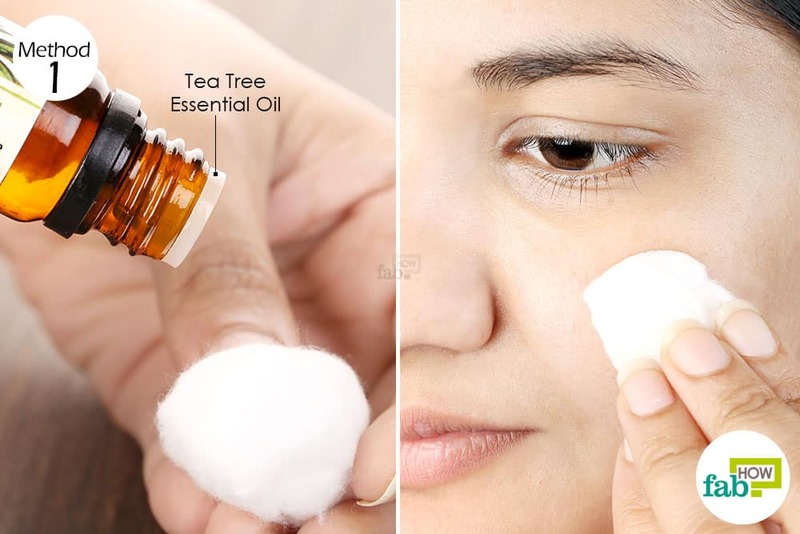 Put a few drops of pure tea tree essential oil on a clean cotton ball or cotton swab. 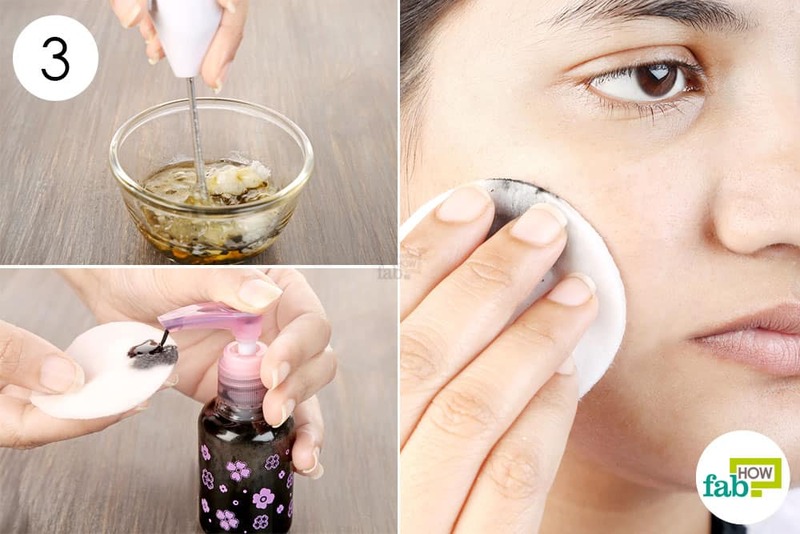 Dab the oil on the acne-affected skin. Ensure that you apply undiluted tea tree oil only on the acne and not on the surrounding skin. Leave it on for 3 to 4 hours or overnight for best results. Wash your face afterward with warm water and gently pat dry. Do this every other day to successfully treat your acne. Continue with regular application till the acne has cleared up. If you have sensitive skin, you can apply diluted tea tree oil as described in Method 2. Those with sensitive skin can dilute tea tree oil in water before applying it to get rid of acne. This solution can also be used as a face rinse and is highly effective for treating cystic acne. Put 1 tablespoon of distilled water in a small bowl. Add 3 to 5 drops of pure tea tree essential oil to the water. Dip a clean cotton ball into the bowl and let it soak up the solution. Apply it on the affected areas and leave it on for 20 to 25 minutes. Wash it off using cool water and gently pat dry your skin using a soft towel. 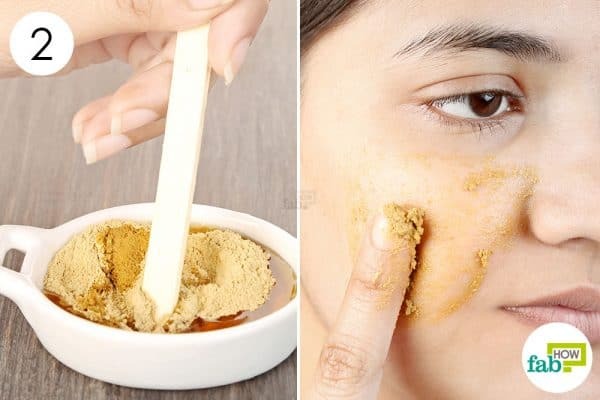 Do this twice daily for at least 1 to 2 weeks to treat and prevent acne. 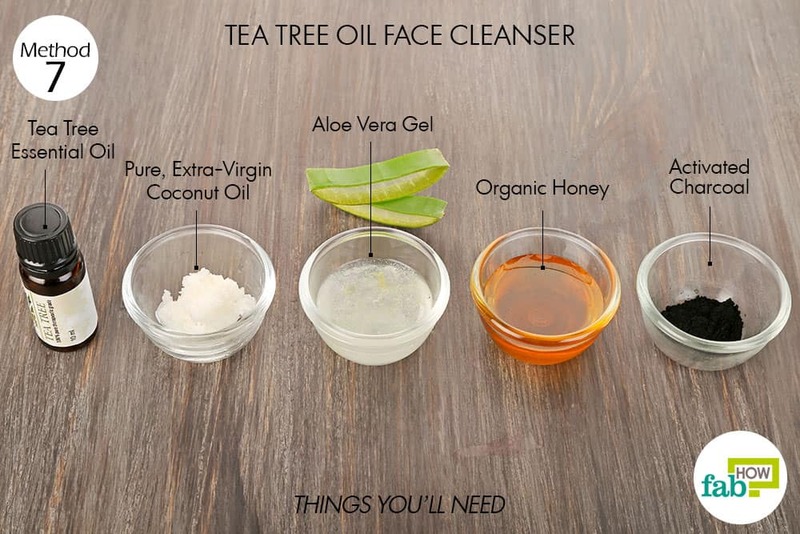 You can also prepare an anti-acne face mask using tea tree essential oil. Here are a couple of options that you can use depending on your skin type. If you have extra sensitive skin, diluting tea tree oil in aloe vera gel will reduce its sting. The aloe vera gel works to soothe inflamed skin and helps dry out and heal the pimples. In fact, you can also use aloe vera gel to treat minor burns and cuts. It also works to naturally lighten skin, therefore it is a highly effective remedy to get rid of acne scars as well. Put 2 teaspoons of fresh aloe vera gel in a small mixing bowl. 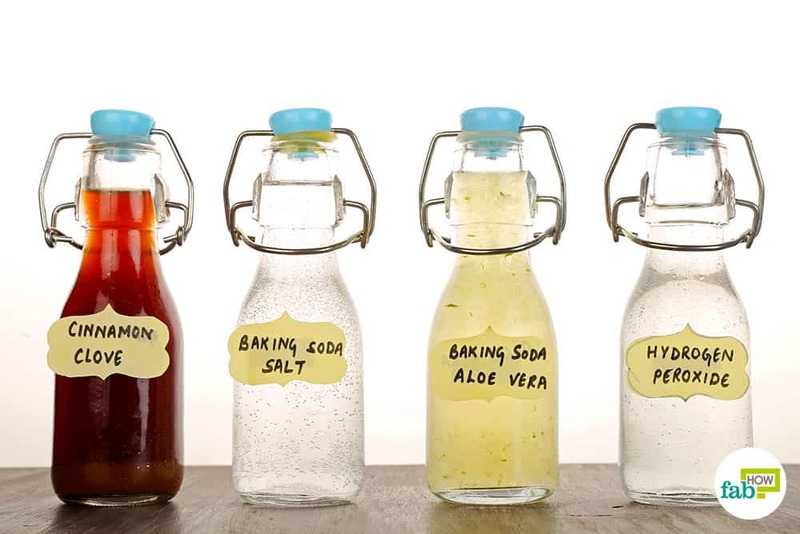 You can learn how to make and store your own aloe vera gel here. Add 3 or 4 drops of pure tea tree essential oil. Use a cosmetic brush to mix the 2 ingredients well. 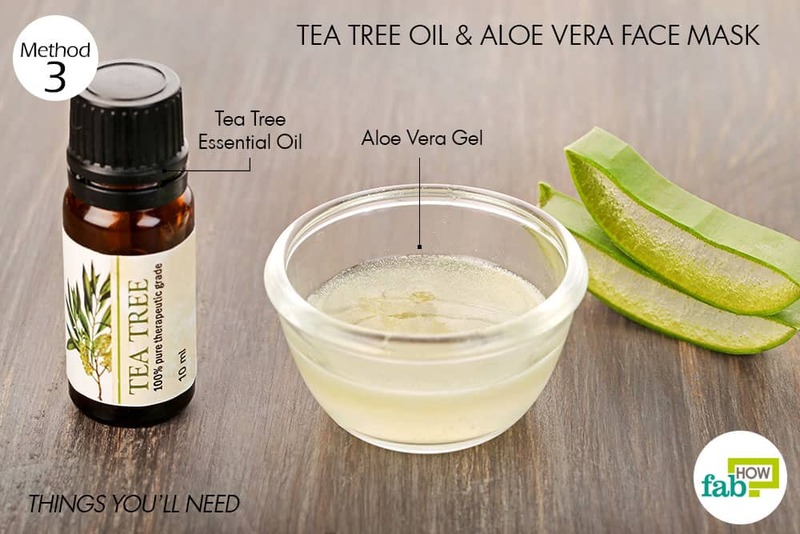 Using the same brush, apply the tea tree oil and aloe vera gel mask on your face. Keep it on for 10 to 15 minutes, then wash it off with warm water and gently pat dry your skin with a soft towel. 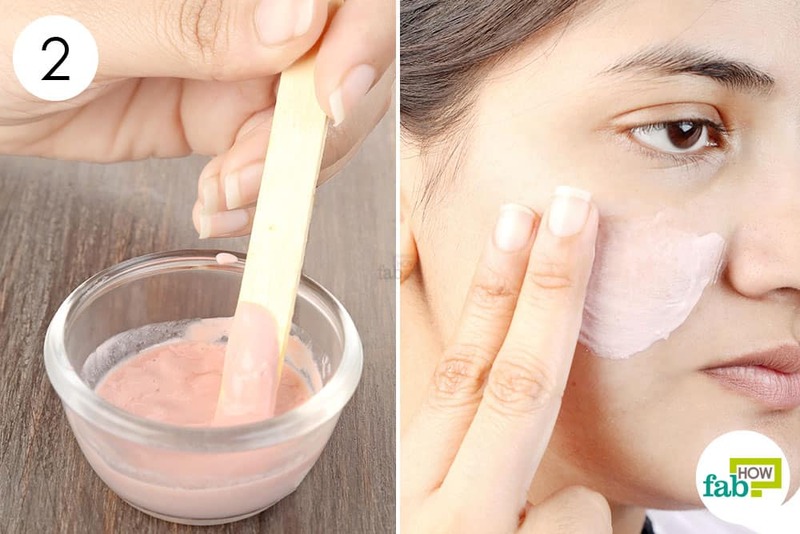 Apply this face mask once every 2 or 3 days to reduce and control your acne breakouts. 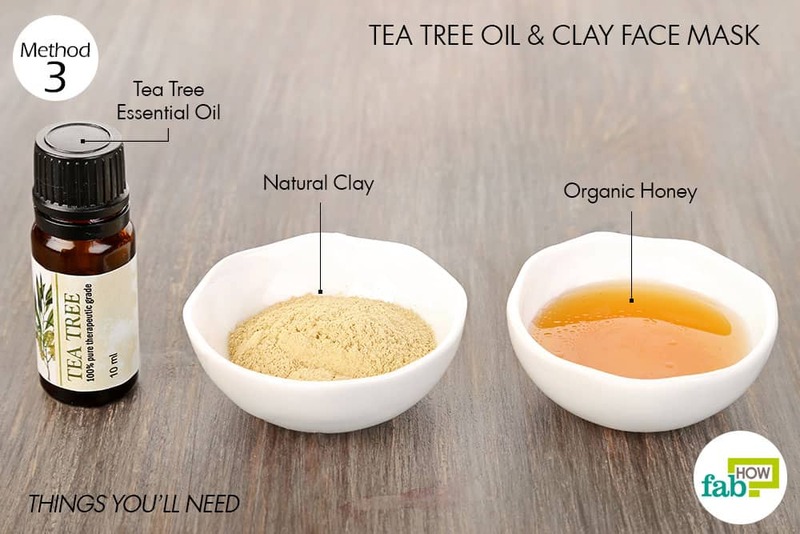 If you have combination skin, this tea tree oil mask with natural earth clay is ideal. It treats acne and absorbs excess oil off your skin, while the honey nourishes and moisturizes the dry patches of skin. Another great benefit of adding honey to this mask is that it has strong antibacterial properties and helps get rid of bacteria that causes acne. 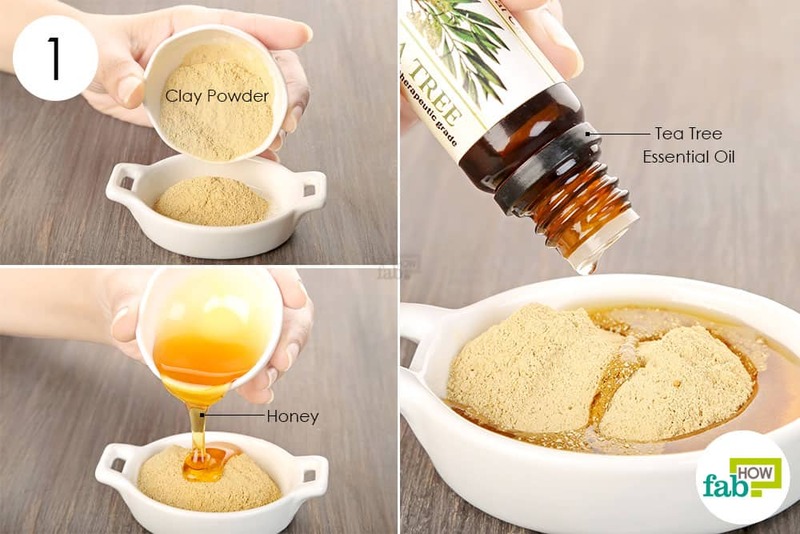 Put 1 tablespoon of natural clay powder in a bowl. Add 1 teaspoon of organic honey. Add 3 to 5 drops of pure tea tree essential oil as well. Mix well with a spatula and apply it on your face as a mask. Leave it on for 20 minutes, then wash your face with water and gently pat dry. Apply this face mask 2 or 3 times a week to get rid of acne and get clear, smooth and blemish-free skin. Another way you can utilize the acne-fighting properties of tea tree oil is by making a light toner to fight acne and oily skin. Blending in raw, unfiltered apple cider vinegar makes the toner a highly effective remedy to get rid of acne. 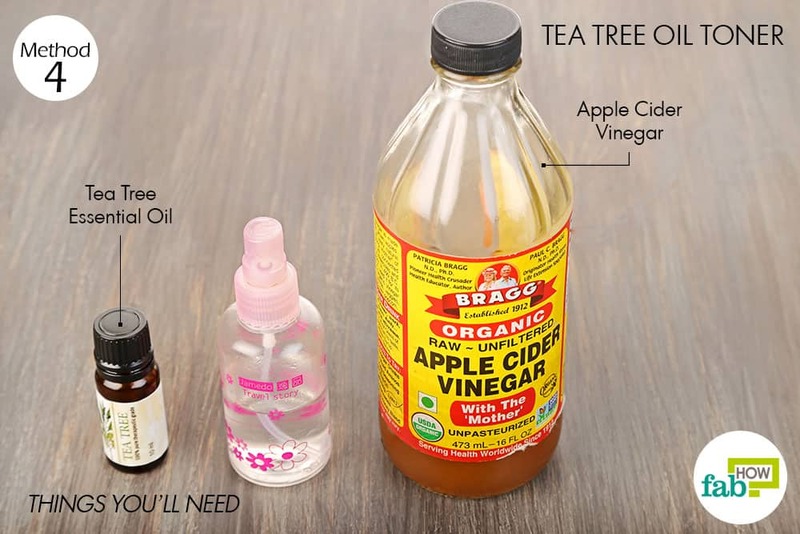 Add ¼ cup of raw, unfiltered apple cider vinegar to the spray bottle filled with ¼ cup of water. Shake the bottle vigorously to mix all the ingredients thoroughly. Spray it on the acne-affected skin to reduce the oiliness and tighten your pores. 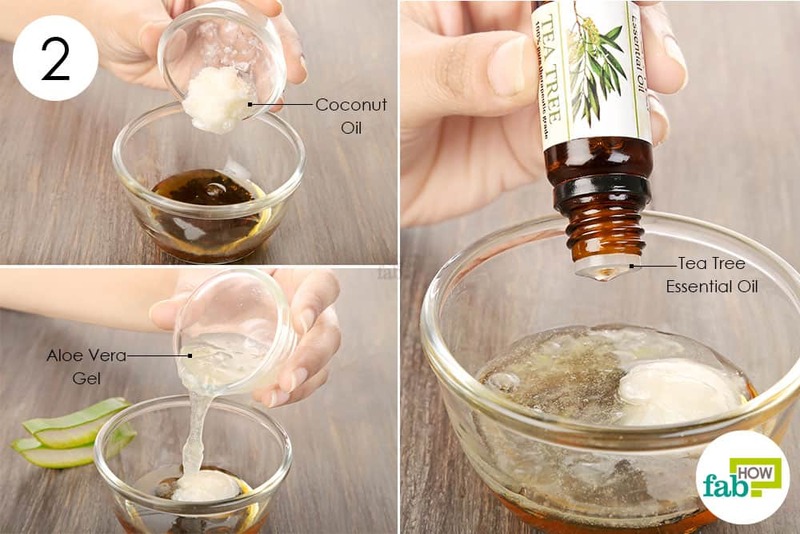 Use this DIY tea tree oil toner daily to get smooth, acne-free skin. 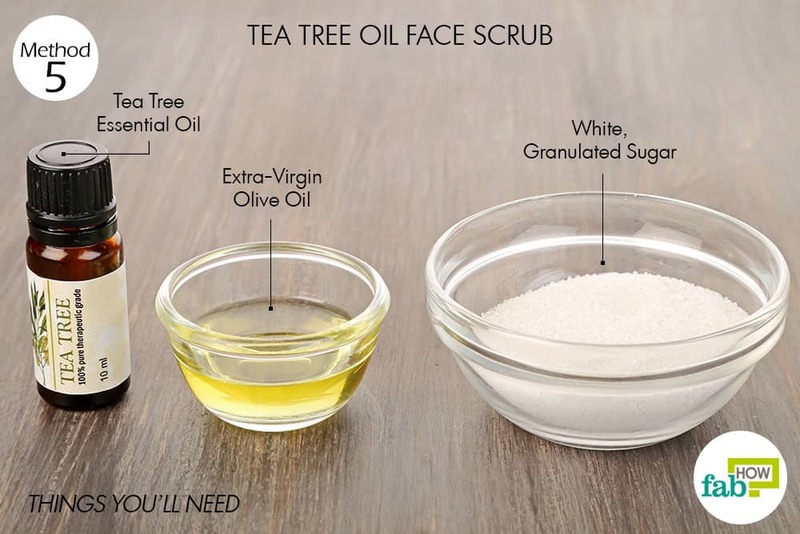 You can also use tea tree oil for acne by preparing a tea tree oil face scrub. 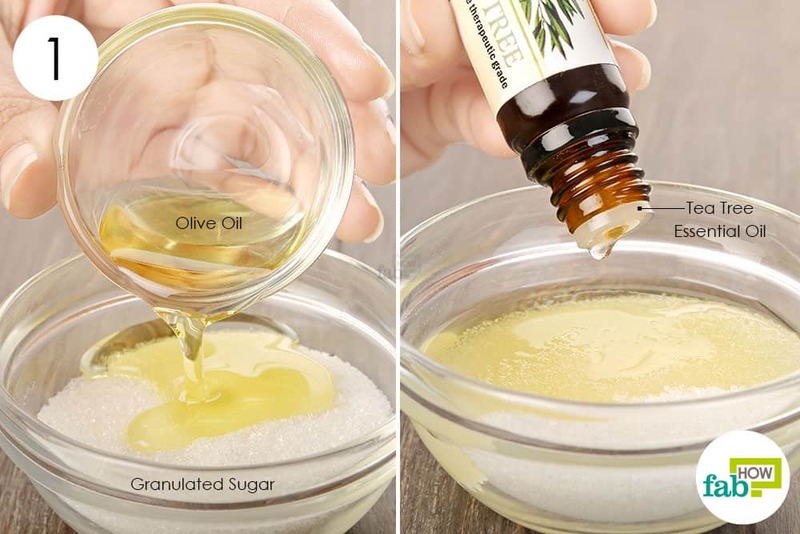 The white, granulated sugar gently exfoliates your skin without being too harsh, while the olive oil soothes and nourishes the freshly scrubbed skin cells. In fact, you can also use olive oil and white, granulated sugar to make homemade scrubs for softer hands. Put ¼ cup of white, granulated sugar in a bowl. Pour in 1 tablespoon of extra-virgin olive oil. Add 3 or 4 drops of pure tea tree essential oil as well. Mix well and use the final mixture to lightly scrub your face. Rub it over your skin in soft, circular motions for proper exfoliation. Rinse it off with water and gently pat dry. 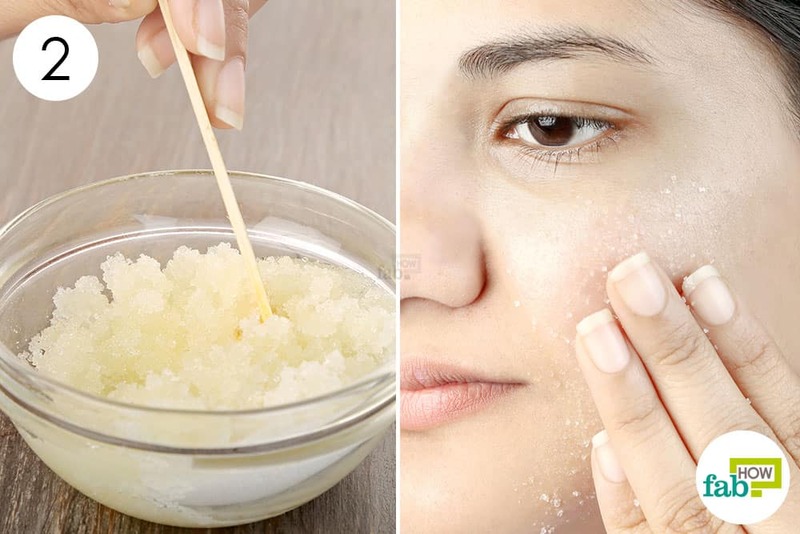 Use this scrub 2 or 3 times a week to get rid of acne. You can safely store the remaining scrub in the refrigerator for up to 1 week. Calamine lotion has a wonderful cooling effect on skin. Additionally, it has excellent oil-absorbing properties that make it a highly effective remedy for countering both acne and oily skin. 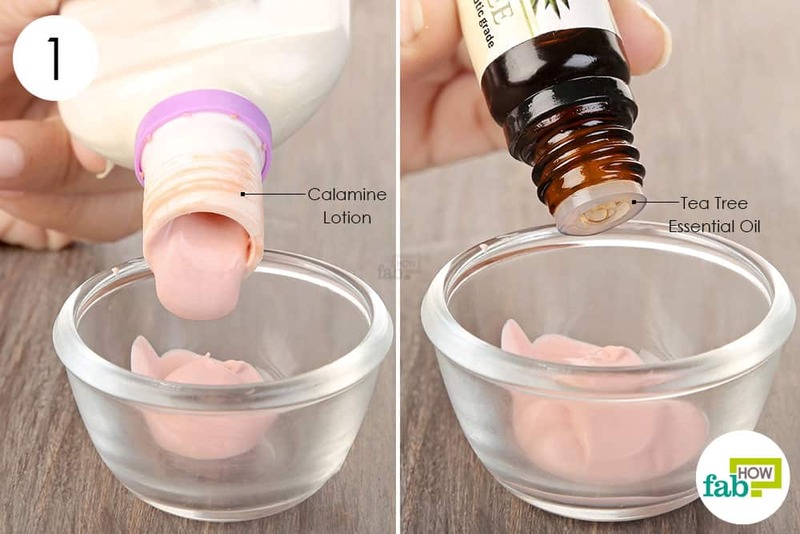 You can also apply calamine lotion to treat bed bug bites or mosquito bites. Squirt out a dollop of calamine lotion into a small mixing bowl. Mix well using a wooden spatula. Gently apply and massage this mixture all over your face. Do this every night before going to bed. 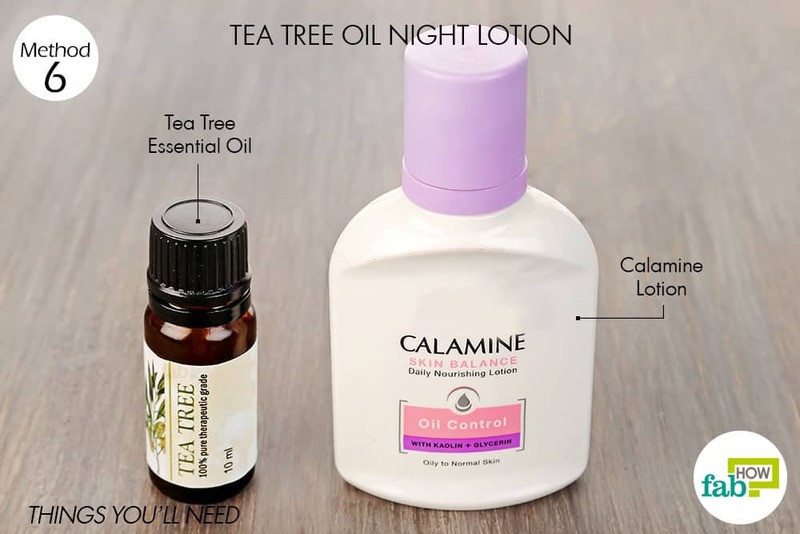 The tea tree oil and calamine lotion will work overnight to dry up the zits or pimples and also reduce the redness and inflammation associated with acne. Tea tree oil can also be mixed with activated charcoal powder to make a powerful cleanser to remove dirt and impurities that may block your pores, leading to acne breakouts. In fact, you can also use activated charcoal to make DIY peel-off masks for blackheads and DIY face washes to get clear skin. This cleanser also contains skin-soothing and healing ingredients like aloe vera gel, coconut oil and honey that will nourish and hydrate your skin. 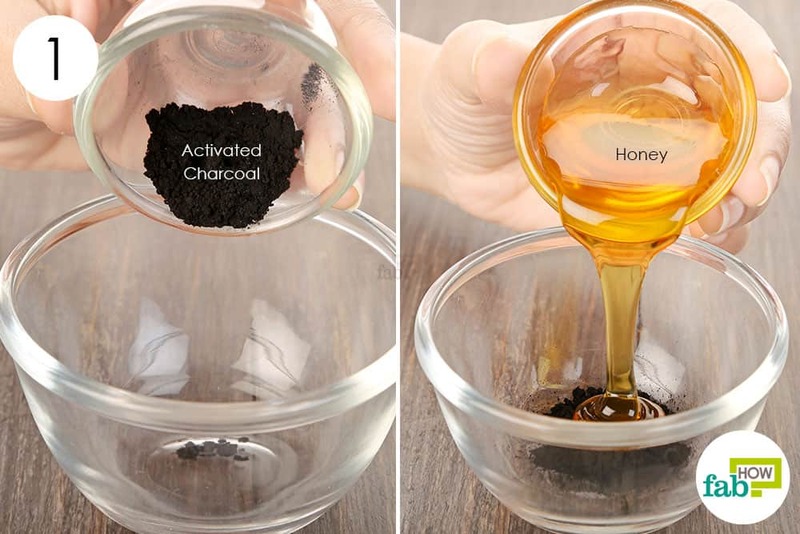 Put 1 teaspoon of activated charcoal powder in a mixing bowl. Add 1 tablespoon of pure, organic honey. Add 1 teaspoon of pure, extra-virgin coconut oil. Add 1 tablespoon of fresh aloe vera gel as well. Add 2 drops of tea tree essential oil to finish it off. Use a motorized hand blender to thoroughly whisk the ingredients together. Transfer the mixture to a pump bottle for storage and ease of use. Squeeze some out on a cotton pad and use it to gently cleanse and wipe your face. You can use this DIY cleanser every day after coming home from work to get rid of all the dirt and impurities collected throughout the day. You can safely store this tea tree oil face cleanser in the refrigerator for up to 1 week. You can add 7 to 10 drops of tea tree oil essential oil into your standard shampoo bottle to get rid of itchy scalp. Tea tree oil is also an extremely effective remedy to rid your scalp of head lice. You can further dilute 5 or 6 drops of tea tree essential oil in 1 tablespoon of extra-virgin olive oil and use it to treat conditions like seborrheic dermatitis and rosacea. For the toner, I did exactly everything it said, and now my face is burning, red, and itchy. Do a swatch test before spraying on the face. You should NEVER use essential oils directly on the skin.